His first key point is that “language and experience mutually influence each other.” That is precisely why the opening to my book-in-progress (Corset Waist Training: A Primer on Easy, Fun, and Fashionable Waist Reduction and Weight Loss), stresses the mind. The path to success in achieving figure re-shaping or weight loss, or one of these goals, with waist training as your method (they are independent goals in, and results of, waist training), is how we think about the process of waist training. If we don’t have what I call “a right mind” when we prepare for dedicated waist training and when we pursue the process, we will more likely than not feel defeated along the way, we will add rather than subtract stress, and we may quit short of our goals. For example, small successes, expected or not, should be celebrated for what they are: successes! Small successes are far more motivating than one huge failure. Success builds on and is inspired by past success, so make it small and make it fun! Enjoy your corset and enjoy your experience! Use positive ways constantly to think about, approach, and express your waist training program and progress. Surround yourself with Yeah-Sayers, not Nay-Sayers. Celebrate every day that you complete a small step in your program — but don’t give up! Stern makes a second key point—and here is where my thoughts turned to corsets. He says that as we spend more and more time online, that constant wired experience “becomes the content of our experience, and in this sense, ‘things’ have earned their name. ‘A thing’ has become the basic unit of cultural ontology.” (NB from Webster’s, “ontology:” a branch of metaphysics concerned with the nature and relations of being). The more we are seduced and sucked into tweeting, instagramming, pinteresting, facebooking, YouTubing, yelping, ubering, checking email, swiping, interneting, texting and the like, the more remote we become from others — and from ourselves. We get hooked on things, and thing-ing each other. We focus more and more on instant gratification, something I have railed against for years, and against the hugely rising tide. So be it; I’m still railing! In my book I make the point that corsets “put us in touch with ourselves” for better or worse. Literally in touch. We don’t have to “touch” our iPhone screens. We are touched by our corsets. We are held by them and we are comforted by them. They are a medicine and an anecdote to remoteness, “thing-ism” and doing the “thing” thing. We come back to ourselves and we pay attention to our every tweak, push, prod, gentling, and stroke of our corset. We can try, but we can’t zone out or forget that we have them on. We become sensual beings once more, out of our minds, into our bodies—for a change. The questions is: how will you choose to spend your time? There’s not a lot to waste! The Roller Coaster Method and Your Favorite Furry Friend? An Amusing Connection! BENEFITS OF THE ROLLER COASTER METHOD OF CORSET WAIST TRAINING: We’ve run across a few methods to corset waist train, but still find our “Roller Coaster” method the best. It has been tested for over 15 years by my 30-odd Coaching Program students, and by me. Clients like Bettina , pictured here wearing a metallic gold leather Training Belt, have used it independently, after reading our training manual, Corset Magic, and it worked for her. It also works for men. Toni is a friend whom we met at the famed Southern Comfort Transgender Conference in Atlanta (now in Florida). 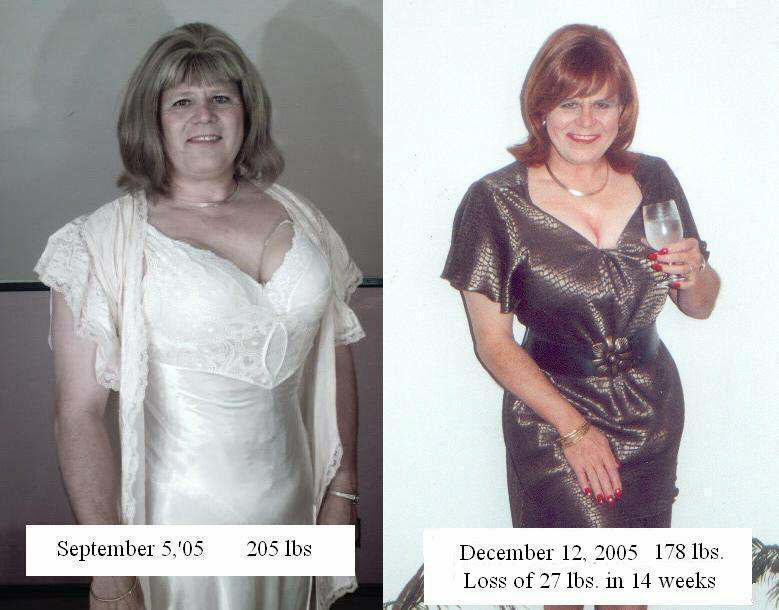 She’s transgendered MTF and loves her now-curvy figure. We discussed the Roller Coaster method several years ago, and she returned home to Ohio and implemented her plan. Look at her amazing results in a short period of time: she dropped 27 lbs in 14 weeks. The method works for an initial training period of a few months, or if you have not corseted for a while and want to get back into the practice to lose a few pounds, or to get ready for a special event, such as your wedding or special party. It starts out with minor and comfortable waistline reduction, perhaps laced down only an inch or two from your snug natural waist, then specifies following a daily predetermined number of hours of wear, usually two or three, for three days. You gradually build up of your hours of wear before lacing down again by from 1/4″ to 1/2″. At that point you drop back to the original two or three hours of daily wear for a few days, build up your hours once more, and then lace down again by the small increment you choose, and continue this up and down pattern. –that you know precisely what is expected of you each day. –there is no guess work involved. –you protect your corset investment, and enjoy the process as you move forward. –you have sufficient variety every few days that you don’t become complacent, bored, or too relaxed with the process. CORSETS AND YOUR FURRY FRIEND? I was watching my favorite Saturday morning tv show today and personality, Cesar Milano, the amazing “dog whisperer.” I hope you have seen him at work. His greater message is that his method applies to how life works, not just to dog training. Cesar’s catch phrase when training unruly dogs is: “calm and assertive.” Calm first, assertive second. That is precisely how the roller coaster method and waist training work, and how you should approach your corset. Think of your corset as your favorite canine friend. You don’t want to wrestle with Fido, you don’t want to fear her, and you don’t want to resist her. Approach your day of corset wear with a calm mind. Expect the best, but be the boss! 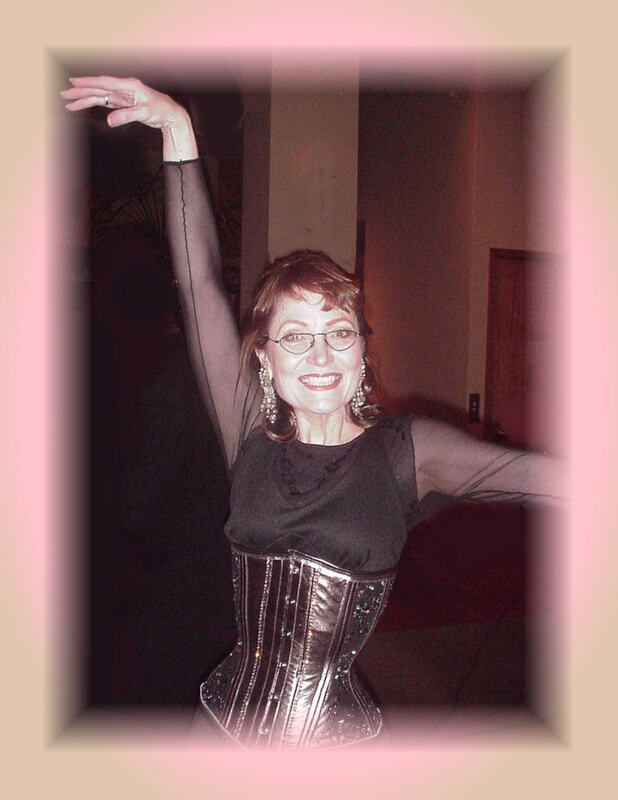 Dianne Danks, an amazing tight-lacer from whom I learned much in the early 2000s when I first began studying waist training, recommends that your mindset should almost be blase, relaxed. “Can you take it or can you leave it?” she asks. Don’t invest too much energy in how you will train that day. Don’t worry if you will meet your day’s goal or not. Put your intention out there that you will. Expect your corset to behave and give you a day of pleasure with some fun challenges ahead. Think of corseting, your new food choices and eating habits, and gentle waist-targeted exercise as just a few more normal activities of daily living. Get into a secure, expected routine exemplified by the Roller Coaster method. Another way to maximize the pleasure of waist training and enhance a feel of calm, peaceful expectation of success, is to have a gorgeous corset waiting for you in the morning (training in the morning when you arise with muscles relaxed and body stretched out, is often the best time to log your hours). If you are about to order your first training corset which we sometimes call your “work horse” corset, it does NOT HAVE TO BE BLACK OR DULL! You can add a pop of color by requesting a cute patterned binding for a black twill corset. Or put a pretty pattern of strong polysilk up side stripes where you won’t be touching it, and strong dot coutil for the rest of the corset. Here are four gorgeous corsets suitable for training. 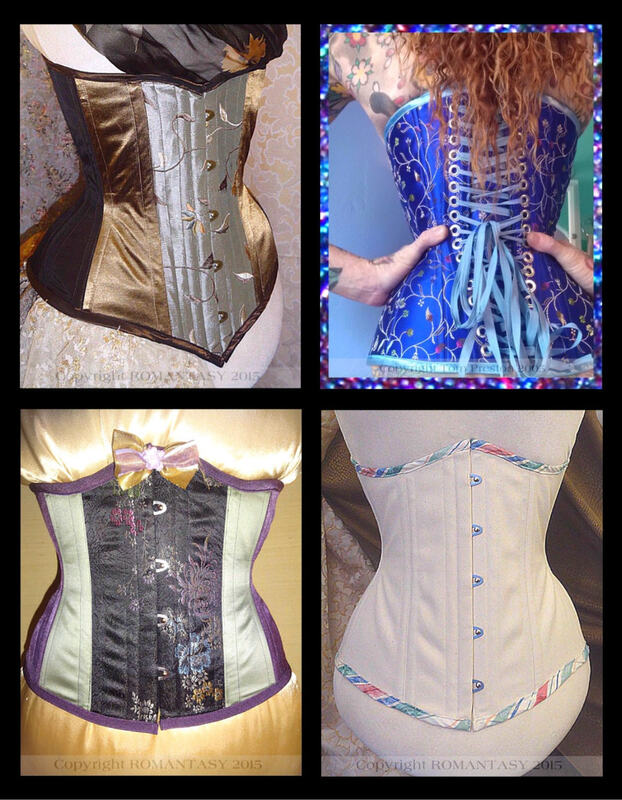 (top left my taffeta corset by Sheri; top right a polysilk corset by Sue Nice; bottom left a satin and polybrocade by Sheri; right a cotton twill corset with patterned binding by Jill). Are they the very strongest and most durable of all corsets? Likely not. But that is your choice to make: Go for something that makes your heart sing each day? Or end up with dreary old work horse that doesn’t inspire you? Here’s another brand new gorgeous new corset by Jill Hoverman from our team, made for Jessie who is training her amazing figure down to a 19″ close in this one, before she moves on to 18″ next. She hasn’t seen the corset yet since she’s out of the US right now, but she soon will and I know she will be pleased! She chose silver crysanthemum polysilk in the side stripes in front, coupled with stiff German dot coutil in the rest of the corset for a handsome design. If you look forward to seeing your art-for-wear garment in colors that make your heart sing, you will readily go into the corset and your body will not resist. One day you will likely reach the “get me outtahere” moment that sooner or later comes to any dedicated corset trainee. Just take a peek once more at that gorgeous, crafted garment you are wearing — one made especially for you and for no one else in the world. I’ve seen some of my clients “pet” their corset! Think about your talented corset maker, and be glad that you are supporting a craft that has from time to time almost become extinct in the US and in the world. Custom corsetry is still not out of danger. Reward your corset with appreciation, much as you would reward your pet with affection and support when they improve their behavior and accept you as their pack leader. Silly concept? Maybe! But I’ll bet it puts a smile on your face today when you reach for your corset and think about my point! Happy corseting day for all.